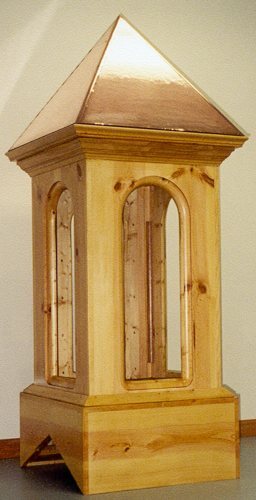 Hand-carved door, a cupola, and more! I built a substantial portion of my house, but what I really like building are things for homes that are both functional and artistic. In other words, things you won't find at any Home Depot. Here are a few of them. I built a shed for my Mom, so I decided to make a custom door that is wide enough (53 inches) to admit her tractor but is also a work of art. 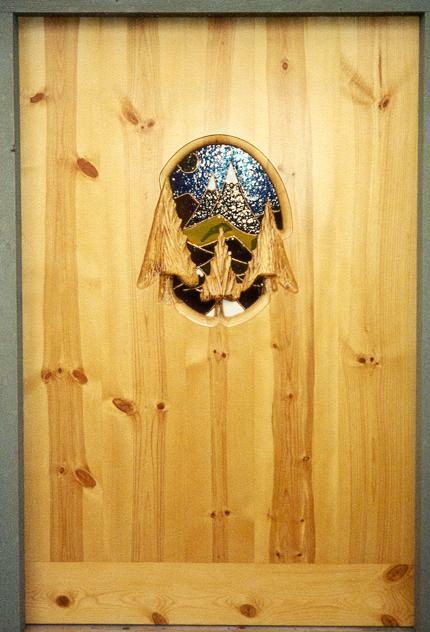 I made this door from scratch, including the stained glass window that lies just behind the trees. 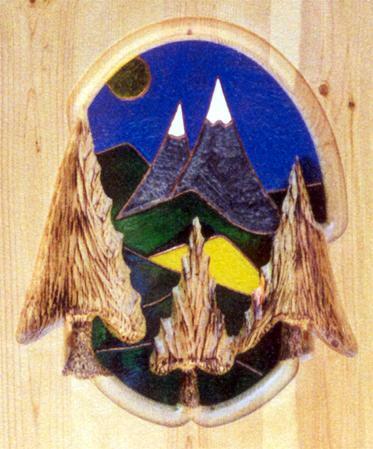 The latter gives the appearance of the three carved trees as being in the foreground, and the stained glass mountains and rolling meadows as being in the background. In my opinion, the neatest thing about the door is that the trees are carved from the same wood as the door; they're not just glued on. Here is a close-up of the window for that door. By the way, the pictures of the door don't do it justice. The door is much more attractive in real life than it is in these pictures, especially when the sun is shining on it . . . then WOW! This may seem hard to believe, but my Mom's door attracted something of a fan club: some people come by every day to see it! Here is another picture of the door. This is the shed I made. 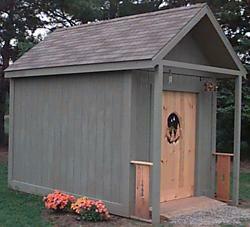 I think the shed would look better if it were made from logs, but my Mom isn't fond of log structures. When I get the time, I'll build a chandelier from glass and copper to hang near the apex of the roof overhang. Incidentally, the decorative railings to either side of the door are sculpted to show the silhouette of a pine tree, but that's difficult to see in these pictures. 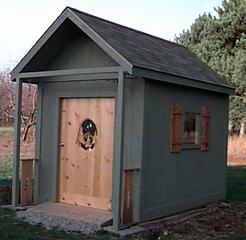 Want to see more sheds I've made? These are much fancier than this one. A cupola (pronounced KWEW-pah-lah) is a small structure surmounting a roof that may be functional but is usually just decorative. This cupola is both. 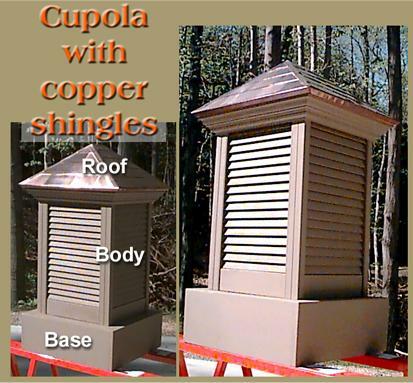 In addition to providing a lot of ventilation through its four louvered sides, this cupola also sports complex crown molding and a four-sided roof topped with copper shingles. Originally, I thought it'd take about a day to build this cupola, but like just about everything I make it took four times longer than I had anticipated. The cupola shown isn't totally complete; I added more molding and another base section to dress up the bottom third of the cupola. The roof is also copper, but this one has a subtle rippled appearance to increase visual interest by enhancing the copper's reflectivity from a wider range of angles. I made four windows for it, but those won't be installed until the cupola is mounted on a roof. This cupola is about 6 feet tall, so there's plenty of interior room for adding a chandelier inside. Another idea I had is to make a display illuminated by LEDs (Light Emitting Diodes). This display could be simple (e.g., red and green LEDs shaped like a Christmas tree) or complex (e.g., a programmable display that'd show a Christmas tree in December, a pumpkin for Halloween, a heart for Valentine's Day, or even a flashing 911 to help paramedics more rapidly find your home if you're having a heart attack!). Yet another idea I had was to install a "Cupola Cam" -- that is, a camera mounted in the cupola. That would transmit its picture either via a cable or wireless link to a television or computer monitor. While it could be used for security, I think it's neat to see pictures taken from high atop buildings . . . it's a much better view up there! Since it took almost a month to make the first hand-carved door, I wasn't exactly eager to build another one. It may look easy to build such a door, but there are literally thousands of steps involved in making one. The tricky part -- and the part that takes so much time -- is that the oval window and 3-dimensional trees are carved from a solid block of wood. It'd be considerably easier to just glue on the trees, but that wouldn't look right. By doing it the way I did, the trees gracefully blend into both the window area and the door itself. 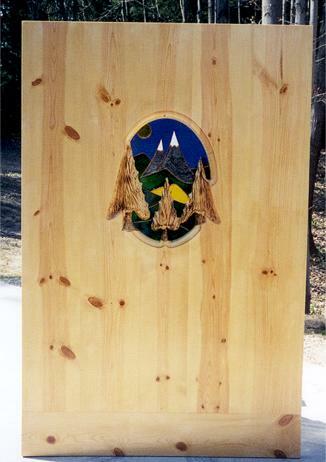 This gives the door its exquisitely unique appearance, and so while it's time-consuming, it's a labor of love to produce such a masterpiece. I built a shed for myself and I couldn't bear to give it a bland, factory-made door, so I made another door. This one is very similar to the first one, but it's the width of a standard door.